Milestone is a significant event in a job that occurs at a point in time. 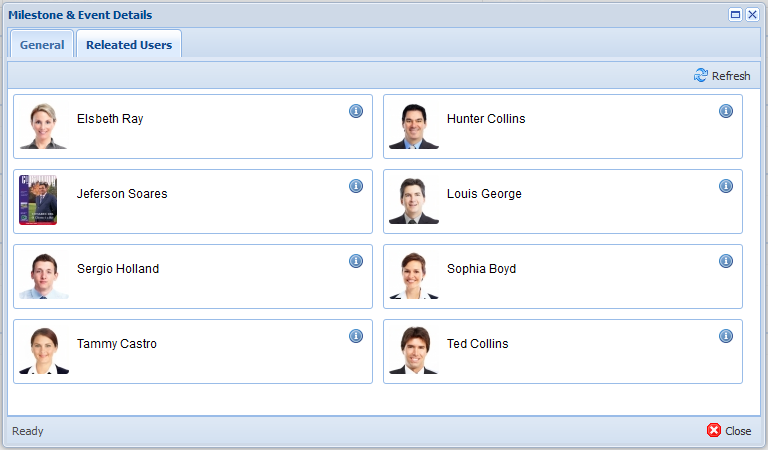 Using Milestones & Events option, OPPTIMO users can schedule deliverables as milestones and also schedule upcoming events. Step 1: Main view -> Click on 'Milestones & Event' tab. 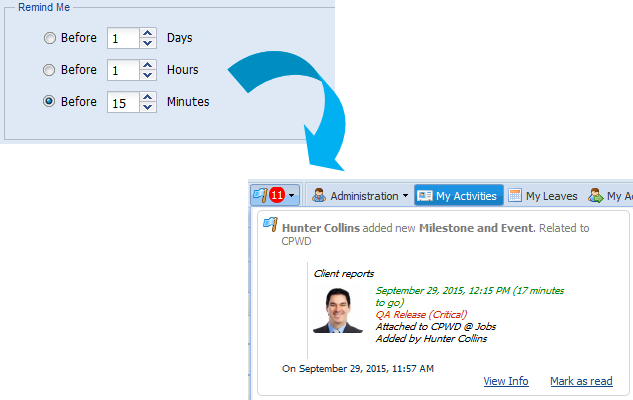 Step 2: Click on button to open ‘Create Milestones & Events’ window. Step 3: Select the option to specify whether the milestone and event need to attached with a specific ‘Job’ or for a specific ‘user’. By default, ‘None’ is selected. Step 4: Enter [Description] about milestone & event. Step 5: Select [Severity] from the dropdown list. Default available Severity levels are Critical, Minor and Trivial. Step 6: Select the [Type] of the milestone & event. 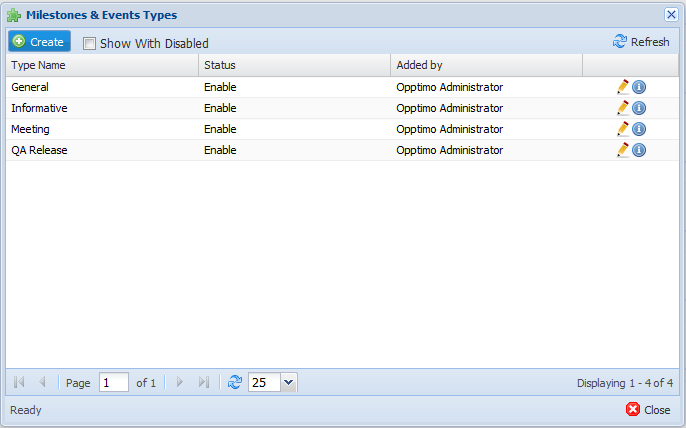 Users with ‘Admin’ permission can setup milestones or event types according to the requirements. Step 7: Setup users whom you need to share the milestone & event from [Who can see] option. To make milestone & event visible to all users, select option. To share milestone & event with selected users, click on option. 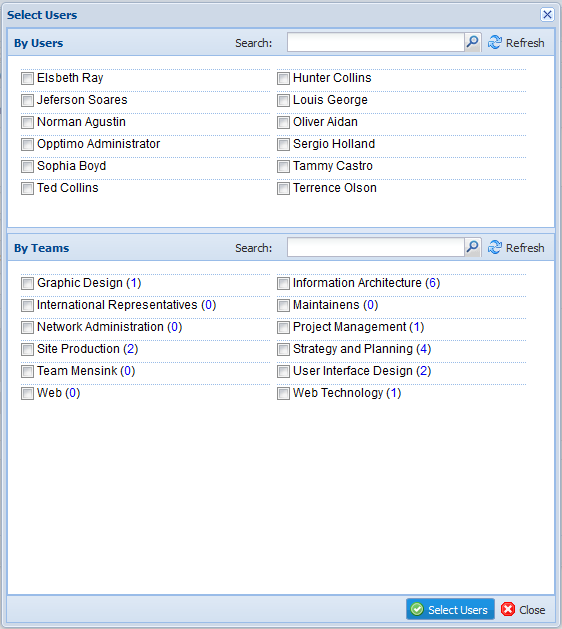 From the below ‘Select Users’ window, select the individual users or teams you wish to make milestone & event visible and click button. To cancel, click on button. To make the milestone & event visible ONLY for the user who created it, do not select any option (i.e. All Users or Select Users). 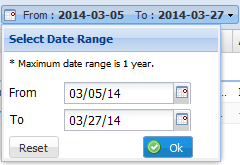 Step 8: Set the date & time from [Date] option as below. Step 9: Set the reminder in days/ hours/ or minutes in ‘Remind Me’. Once you set a reminder, the application will send a notification automatically. Step 10: If you need to set a recurrent reminder, click on option and select [Type] & [To Date] you need to receive a reminder for the scheduled milestone & event. Step 11: Click on button to save the milestone & event OR click on button to cancel the operation. 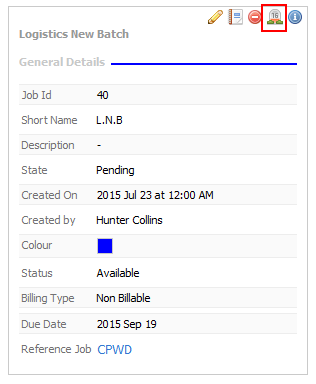 Step 1: Main View -> Jobs -> Click on ‘Add Milestone & Event’ option on the selected job. Step 2: Enter [Description] about milestone & event. Step 3: Select [Severity]> from the dropdown list. Default available Severity levels are Critical, Minor and Trivial. Step 4: Select the [Type] of the milestone & event. Users with ‘Admin’ permission can setup milestones or event types according to the requirements. Step 5: Setup users whom you need to share the milestone & event from [Who can see] option. 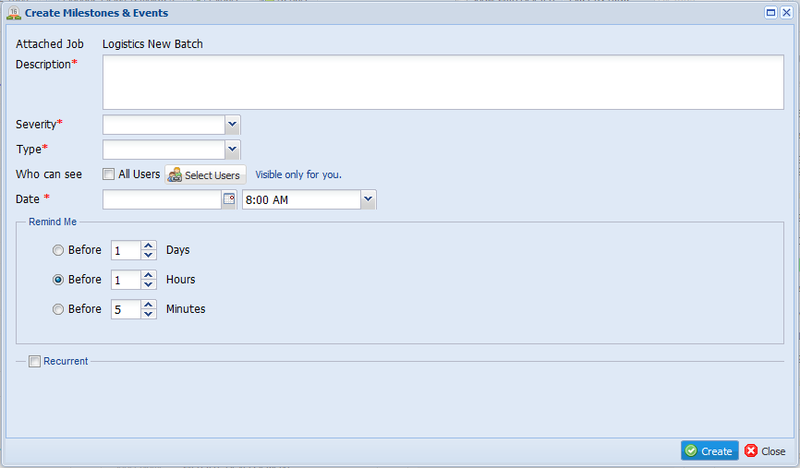 Step 6: Set the date & time from [Date] option as below. Step 7: Set the reminder in days/ hours/ or minutes in ‘Remind Me’. Once you set a reminder, the application will send a notification automatically. Step 8: If you need to set a recurrent reminder, click on option and select [Type] & [To Date] you need to receive a reminder for the scheduled milestone & event. Step 9: Click on button to save the milestone & event OR click on button to cancel the operation. To add a reminder for a created milestone & event. Step 1: Go to tab -> Click on ‘Add Reminder’ icon on the milestone & event you need to add a reminder. Step 2: Set the time you need to get reminders from below ‘Remind Me After’ window. Step 3: Click on button to set the reminder OR click on button to cancel. Once you set the reminder, the application will send you reminder notifications. Using this option, you can change the time of a milestone & event which is already created. Step 1: Go to tab -> Click on ‘Change Time’ icon on the milestone & event you need to change the time. 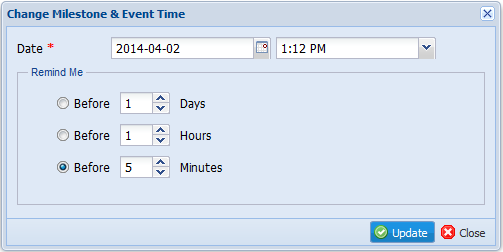 Step 2: Change the [Date] & [Time] in below ‘Change milestone & Event Time’ window. 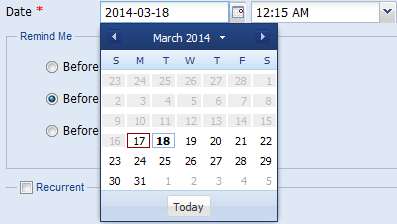 Default, current scheduled date & time will display in the ‘Change milestone & Event Time’ window. Step 3: Click on button to save changes OR click on button to cancel. Using this option, you can mark the milestones or events which are ‘Completed’ or ‘Pending’. Step 1: Go to tab -> Click on ‘Update Status’ icon on the milestone & event you need to change the status. Step 2: Select the [Status] as ‘Pending’ for uncompleted milestones/ events and select ‘Completed’ for concluded milestones/ events. To edit information of a created milestone & event. Step 1: Go to tab -> Click on ‘Edit’ icon on the milestone & event you need to edit. Step 2: Update necessary details of the milestone & event in below ‘Update Milestone & Event’ window. Using this option, users can delete milestones or events which have been created previously. Step 1: Go to tab -> Click on ‘Remove’ icon on the milestone & event you need to delete. Step 2: Click button to confirm the deletion OR click to deny the action. 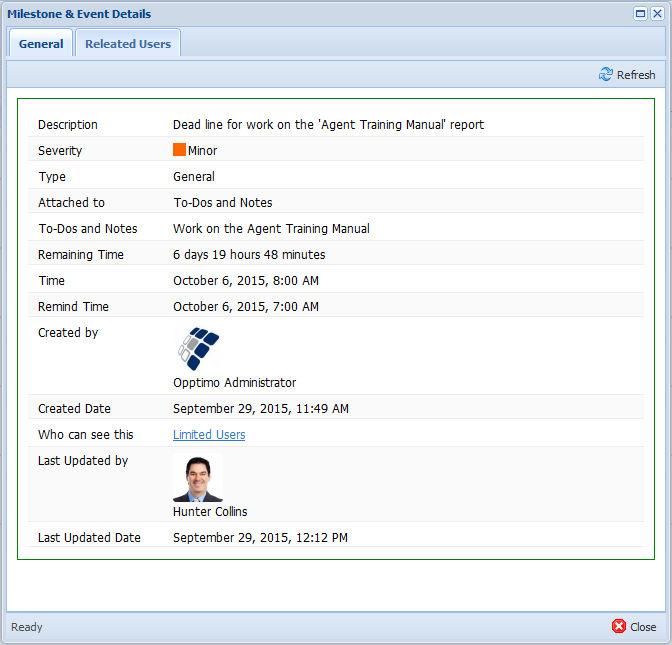 Once the deletion is completed message will be displayed at the bottom of the window. To view the information of added milestone & event. Step 1: Go to tab -> Click on ‘View Information’ icon on the milestone & event you need to view details. Step 2: Using tab of ‘Milestone & Event Details’ window, you can view the general details of milestone & event including details of last updated person. Using tab, you can view the all users who have permission to view the milestone & event. 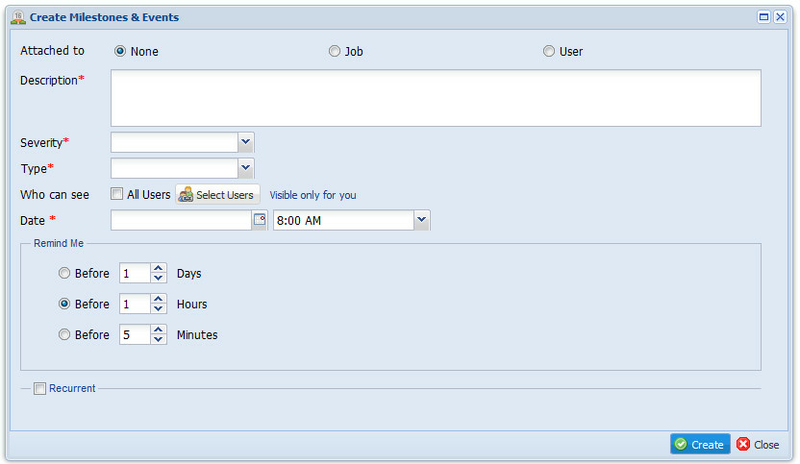 By clicking on ‘View User Information’ icon, you can view the user information of particular user you need as below. Using this option, you can filter milestones or events by Severity/ Status or Date. Select the [Severity] option you need to filter from dropdown as below. If you need to filter milestones or events of all severity levels, select ‘All Severity’ option. Select the [Status] you need to filter from dropdown as below. If you need to view milestones or events of all status, select ‘All Status’ option. Select [From] and [To] date range you need to filter using option. To create new milestones/ events type, edit types, view type details and to enable or disable existing milestones/ events types. Go to tab -> Click on option to open the ‘Milestones & Events Types’ window. Step 1: Click on option -> Click on button. 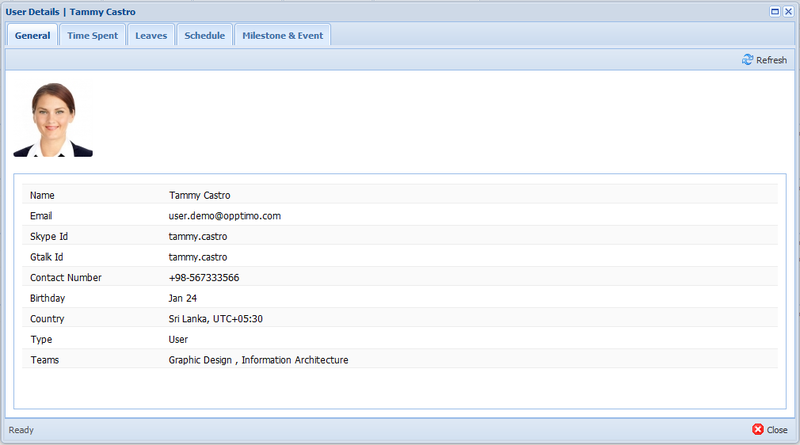 Step 2: Enter [Name] and [Status] of the new milestone & event type in below ‘Create Milestone & Event Type’ window. Step 3: Click button to save the new milestone & event type created OR click button to cancel. Step 1: Click on option. Step 2: Click on ‘Edit’ icon in front of the [Type] you need to edit. Step 3: Do necessary changes in the below ‘Update Milestone & Event Type’ window. Step 4: Click button to save the changes OR click button to cancel. Step 2: Click on ‘View Information’ icon in front of the [Type] you need to view type details and below ‘Milestone & Event Type Details’ window will appear. Step 3: Click button to exit from the window. Click on option -> Select option. Using this option, you can export milestones & events into Excel/ CSV or iCalendar that can be viewed in Microsoft Outlook or in Google Calendar. Step 1: Go to tab -> Click on button. Step 2: Select the format you need to export milestones & events as below. Step 3: Do necessary changes in below ‘Export Milestones & Events’ window. Step 4: Click button OR click button to exit from the window.